It’s 2006. Our party are trapped on a frozen island on a forgotten continent, miles from Faerun. Unable to leave due to a binding spell placed on us by our enemies, we have searched the island for a way out. Finding evidence of ruins beneath us, we start to dig our way in. After the near death of the entire party when we trigger a trap, we find our way down into the main hall and start to decipher the writing we find within. Our DM, Mike, starts to read us rhyming warnings when one of us, Mark, stops him. Mike just smiles. Mark looks at us all. Dread fills the table. Our Breathing Quickens. We know, without a doubt, that this adventure – Just. Got. Real. It’s perhaps the most famous of all dungeons in all of D&D and after the release of Ready Player One, it’s set to get a whole lot more famous. For years, its name has inspired fear in almost all but the most steadfast or foolhardy players. 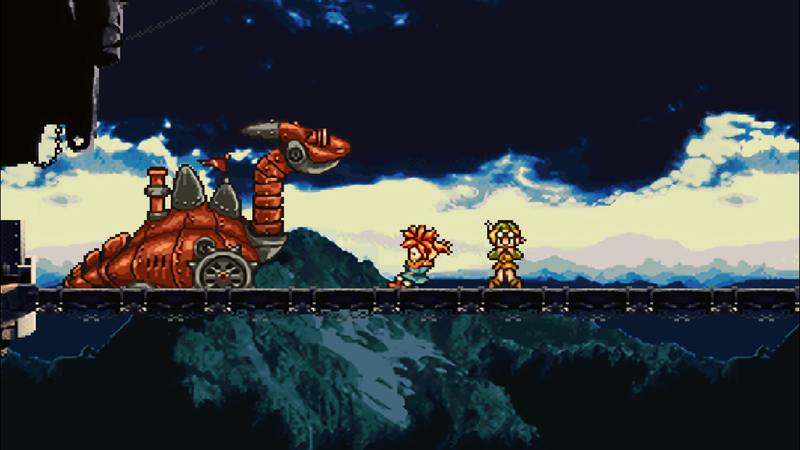 But what has made it the most iconic of all the early dungeons? And is the reputation deserved? 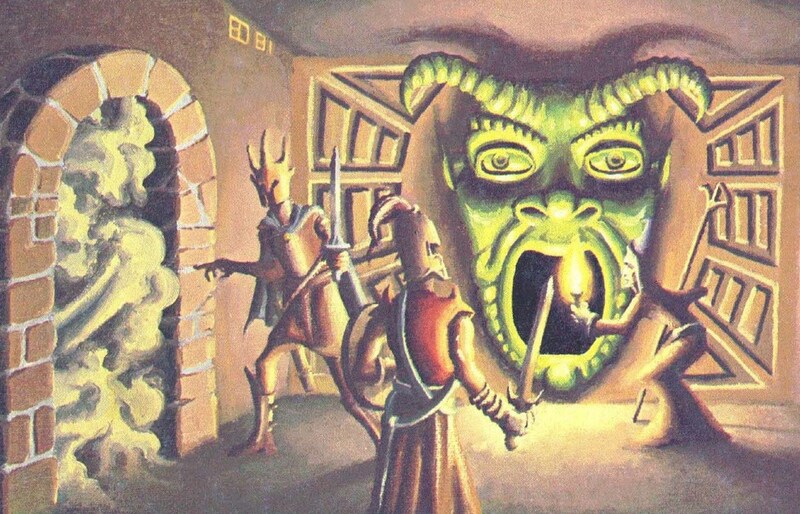 Join us on a look inside the walls of Tomb Of Horrors, if you dare. To understand Tomb of Horrors, we first have to look at where it came from. Born from a convention Tournament – a style of play where players would sort of compete to so see who could survive and complete a dungeon in the best/fastest way, ‘Competition style’ D&D has waned now due to a change in our relationship with the game. Adventures born of it expected you to use your mental skills, not be too annoyed if your character died a horrible death and not need to much of a story reason to be entering the dungeon beyond ‘we heard there’s loot’. You can see the dungeon is built for a tournament in design from day one – it has several ‘win conditions’ that are different levels of success, some of which I’m sure were design to be talked about with other people who had played the game. I can imagine to this day players says ‘You did that? You realise you missed This Bit, right? That’s the Proper ending!’. Oddly, Wizards have circled back round to this ‘Shared story’ ideaology in the Adventurer’s League Program – probably the first experience a lot of people seeking out D&D group might encounter. So what has made Tomb Of Horrors so iconic? Why has it had a version published for almost every edition? Well, there’s a number of reasons. The first is that it is horribly deadly, perhaps more so as it has aged. The style of play that it needs is almost alien to players of the current edition. 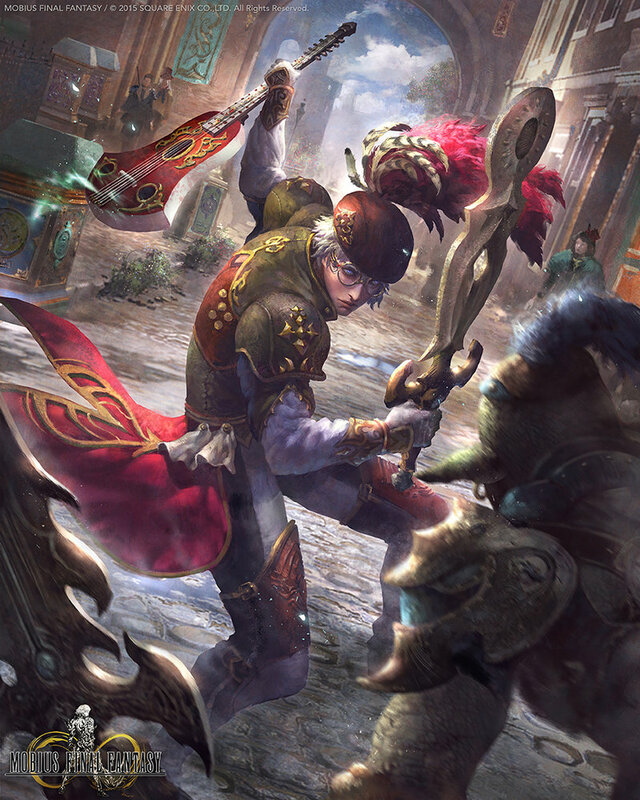 It features almost no combat and requires you to think rather than lean on a skill system to resolve traps. Even when it was released, it worked against players who were anything but paranoia-level cautious. In the example above, we had two deaths inside the tomb and a couple of close misses. This threat level gives the Tomb a feel of real danger, those that have played it through wear it like a badge of pride. People want to be able to achieve things, and surviving the tomb is the D&D equivalent of climbing Mount Everest. Another reason is its villain. Unlike most bad guys in D&D, who are not happy to have adventurers up in their crib, wrecking their carefully laid plans, Acererak wants them there. He welcomes adventurers to try his creation. He’s even left them clues. He’s like a demented Riddler figure and the heroes are his Batman. It’s a straight up battle of intellects and the Tomb tells that story. Played correctly, heroes can find out why Acererak built the tomb and what he really is. Character Killer… and Fun Killer? In 2016, John Wick (Legend Of Five Rings, 7th Sea) wrote a now infamous piece on the Tomb where he called it the ‘worst dungeon ever’ and cited an incident that caused him to nearly lose all of his friends because of the way it was designed. This sparked a huge internet debate in which some claimed Tomb was a badly designed player-killer that set a standard where it became fine for a Dungeon Master to be an adversary to the players. This, they suggested, may have set the hobby back many years as nasty behaviour abounded and the idea of creating a story got pushed to the back burner for too long. Which is not true. But it’s not untrue either. 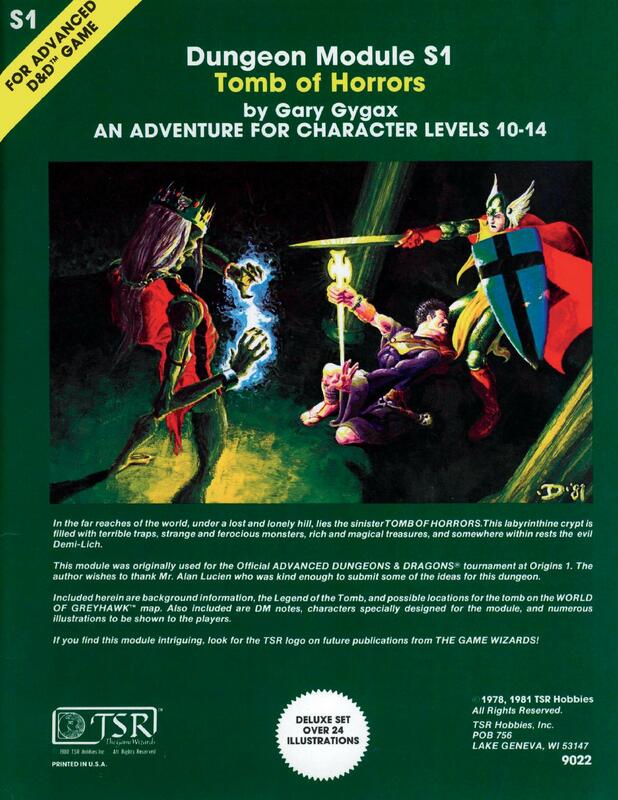 The problem really came when Tomb of Horrors was marketed as a game you could just slot into your home game. Home games of D&D tended to have long running characters with epic tales and backstories. Without a DM having some kind of plan for if it all went south, just plonking the Tomb in the middle of all that could derail years of play as well known heroes were crushed and trapped forever, oblivionised or worse. In the worst of all traps in the dungeon, some characters are just…gone. But in many ways, that WAS the fun of it. Maybe more so than ever, this game rails against the modern sensibilities – players in 5th edition are far less likely to die from random misfortune and that subversive nature has amused players and DM’s alike for decades, extending the Tomb’s shelf life through a kind of shared schaudenfreude . 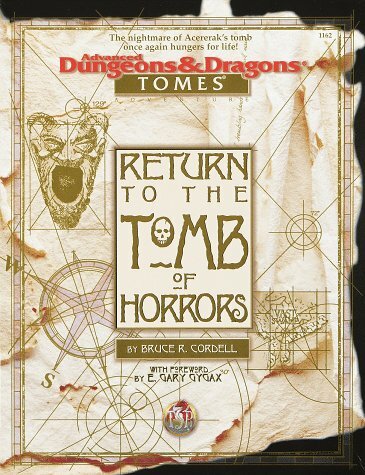 It could also be argued that the adventure inspired game designers to write adventures that were more like the game they wanted to see, sort of ‘reactions’ to the Tomb – dungeons focused on moving parts and story like Laura & Tracy Hickman’s Ravenloft, Monte Cook’s The Banewarrens or Thomasson Et al’s The Shackled City, the first true ‘Adventure Path’. This leaves it as a piece of D&D history we can’t just pluck out. It also helps that people keep bringing it up. Acererak appears in all kinds of products. In Return to The Tomb Of Horrors (1998), he becomes a multidimensional figure and in Revenge Of The Giants (2009) you can go back in time an meet him before it all kicks off. His timeline is so complex, it’s hard to put it all together. It’s impossible to get through a D&D discussion without mentioning it at some point. It’s become part of the cultural landscape. You’ll hear jokes about the big green face or someone will have a unique story to tell (If you ever run into me, ask me what happened to the badger). Which brings us neatly to Tomb Of Annihilation. For those of you not in the know, there’s a new Tomb. In the latest Adventurer’s League season, Acrerak returns and puts a massive whammy on the forgotten realms. There’s a new tomb that you have to find and it’s…somewhere. The wonderful thing about this adventure is that it has call backs to the original adventure, meaning that even if you have someone with you who has all the D&D experiences in the world, they are on a similar footing to new players. There are some things that look like the same traps as the original Tomb…but do they work differently, or exactly the same? Or Both? If you are looking for a modern version of the Tomb experience, look no further than this adventure. So How Do I get through alive? Oh look, I’m out of words. What, really? One piece of advice? Take a ten foot pole. And a badger. The results will at the very least be hilarious.